Club World Casinos is a fresh new online gambling website that is already causing heads to turn in the internet casino industry. The site uses RealTime Gaming software, and since they accept US players, the site already has a big player base. Graphically it’s one of the best new casinos of the year. Plus, they offer a comprehensive selection of games, huge bonuses for all players, and they even hold regular tournaments! And it’s all wrapped together in one great package for players to enjoy. Club World Casinos chose to go with RealTime Gaming (RTG) as its software provider. RTG is best known for their realistic graphics and smooth gameplay. The casino comes in two varieties – a download version, which lets players install the full casino on their home computer, and a no download instant play version, which gives members access to a limited game selection from any computer with no installation required. This choice lets players have the best of both worlds, as they can play the full downloadable casino at home and the instant play casino when on the move! 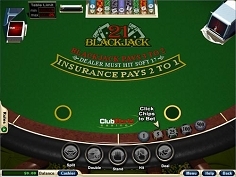 There are several blackjack games available to choose from at Club World Casinos. All offer photo-realistic graphics, smooth animations, and simple gameplay. Of all the online blackjack games on offer, the best is definitely their Classic Blackjack game. It’s a brutal battle against the dealer, with a table limit of 25, and a low 1 minimum. That makes it perfect for every size of pocket! Plus, five chip sizes makes it easy to place the ideal bet. It’s a great way to enjoy real-money blackjack online. 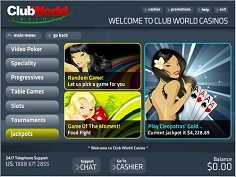 A wide range of RTG games is available in the Download version of Club World Casinos. There are more than 120 different casino and casino-style games offered to members. All standard games are available, from Roulette and Baccarat to great Poker titles like Pai Gow and Caribbean Hold’em. Extended titles like Bonus Bingo and Sic Bo add great variety, and really help complete the selection of games at Club World Casinos. New players at Club World Casinos are greeted with a 100% match bonus on their first deposit, good for up to $777. That bonus is good for Video Slots, Keno and Scratch Cards, but if you prefer to just play Blackjack, Video Poker, Casino Poker, grab a special 100% startup bonus up to $150! Club World also offers a great comps system for regular players, plus exclusive VIP rewards for top members. Finally, look for special weekly promotions to earn even more. Overall, Club World Casinos offers a fine service to its players. They started with a very smooth and classy design, devoid of the usually cartoon graphics, opting instead for a dark, modern interface. They then added a huge pile of games, a dash of spicy bonuses, and topped it all off with a fine VIP/Comps plan. The end result is a well-conceived web casino with all the right toppings!